I was 6 years old on that day. We lived on West 29th Place, which back then was a dead end street off of Spenard Road. Now days it's Benson Blvd south of Safeway, REI etc. Family friends were visiting and there were 4 of us kids playing in one of the back bedrooms. I was coming out to tell on my sister for some reason and passed a large house plant that seemed to be vibrating. I was trying to get my mother's attention about the plant, but was being ignored by all four of the adults. Then the shaking started, pretty light at first. One of the adults said "oh, we're going to have an earthquake" like it was no big deal. By the time the other 3 kids made it to the dining room, it was going pretty strong. The cabinets were emptied as the house rolled up and down, like a boat in 15 foot swells. All 9 of us (little sister was 6 months old) clung to each other in the doorway between the dining room and the living room. After, I remember having to go to bed that night and having aftershocks in the 6s and 7s, melting snow on the Coleman stove for water, eating C rations, putting chlorinated water in plastic jugs and lining up for our shots. The next day, Dad and I went downtown to check on my Grandmother who lived in my Dad's childhood home at G St between 7th and 8th avenues. 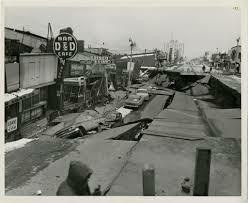 I remember seeing some buildings that had fallen down, but we didn't go near 4th Ave. Surprisingly, there was little damage to our house, we had an oil heating system and the chimney fell. That was it. I live in Florida now, I don't do earthquakes. You lived close to us; we were on 32nd between Minnesota & Spenard.